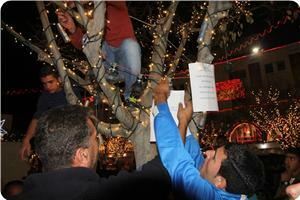 Palestinian activists decorated a Christmas tree in Manger Square in Bethlehem with teargas grenades and rubber-coated bullets. Dozens of Palestinian youths in Bethlehem have collected tear gas grenades and rubber-coated bullets, fired by Israeli forces during clashes, and used them for the decoration of the Christmas tree. One of the activists told the PIC reporter that this action is meant to send a message to foreign tourists coming from all over the world to celebrate Christmas in Bethlehem that this city is subjected to an Israeli racist, repressive occupation. These tear gas grenades and rubber-coated bullets were made in the United States and provided to the Israeli occupation to be used against Palestinian children, elderly people and women in different parts of Palestinian towns, cities, and refugee camps, he continued. He explained that this is a straight message to the international community and the US administration to support peace instead of continuing to support the occupation. Scores of Palestinians and foreign sympathizers on Monday use fishing boats to sail six miles off the coast of the Gaza Strip in defiance of an Israel-imposed sea blockade on the Palestinian coastal territory. Intifada Youth Coalition(IYC) launched the voyage at 10 o’clock am after holding a press conference on both Arabic and English languages in addition to speeches for foreign activists and Fishermen's Union Association. “lifting the siege is a must and a duty on the international community; the Gaza Strip is living without electricity since the last month and is threatened by health disaster due to lack of fuel,” said IYC. Israel specified a six-nautical mile fishing zone for Palestinians in 2006. This has negatively affected local fishing activities, as Gaza fishermen say they can now only fish 1,500 tons of fish every year, compared to pre-blockade hauls of some 4,000 tons annually. 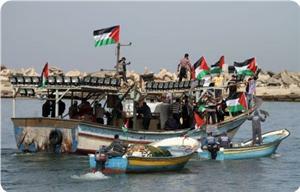 Around 40,000 Gaza residents earn their living through fishing, according to the Palestinian Fishermen's Union. Israel Navy has declared its readiness to intercept the Steadfastness and Justice Convoy to break Gaza siege expected to leave Gaza on Monday aiming to break the naval blockade six miles from the Gaza shore. The Israeli occupation authority has tightened its economic, political, aerial, maritime and land siege on the Gaza Strip during the last few months in an attempt to break the Palestinian people's determination and steadfastness. Israel Occupation Forces and the Israeli Navy began preparations and reviewed standing orders to deal with the planned flotilla, Israel Today Hebrew newspaper said. The convoy was organized by Intifada Youth Coalition (IYC) where it was planned to take place last week, but it was postponed for unknown reasons. IYC declared on Sunday that the convoy, named "Steadfastness and Justice Convoy", will be launched on Monday at 10:00 am from the Gaza port under the slogan of "Steadfastness of Fishermen and Questioning the International Justice". The coalition pointed out that the activity will include conferences in both English and Arabic languages and speeches for foreign activists and Fishermen Union Association. About 200 participants, including foreign activists and journalists, will board 20 boats to send letters in bottles to the international community in English and Arabic. Intifada Youth Coalition (IYC) has declared on Sunday that it has finished its preparations to launch the convoy to break the naval blockade on Gaza. The coalition stressed that the convoy will break the barrier of the six nautical miles despite Israeli threats to intercept the boats. Since the beginning of the al-Aqsa Intifada, Israeli forces have repeatedly imposed a total marine siege on the Gaza Strip, preventing Palestinian fishermen from working. They have also decreased the area where fishing is allowed from 20 nautical miles as provided for in the Israeli-Palestinian agreements to 6 nautical miles. Israeli occupation forces have also created two marine security zones, each is 2 square miles, one in Rafah near the Palestinian-Egyptian border in the southern Gaza Strip and the other in Beit Lahia in the northern Gaza Strip. Palestinian fishermen are prevented from getting close to those two zones, so the area where fishing is permitted has further decreased. Although Palestinian fishermen do not exceed the area where fishing is allowed, Israeli naval troops often attack them in an attempt to force them to give up their jobs. They chase fishing boats, spray them with water cannons and fire at them to terrify fishermen. Dozens of injured and disabled Palestinians have participated Wednesday afternoon in a human chain against Israeli siege on the Gaza Strip. The human chain stretched along Omar Mukhtar Street in Gaza, where the participants raised Palestinian flag and banners condemning the siege imposed on them and calling for urgent intervention to put an end to the difficult humanitarian situation. MP Jamal al-Khudari, Chairman of the Popular Committee Against the Siege, stressed during the event that Israeli racist and arbitrary measures will never break Palestinian people's determination. He pointed out that the Israeli siege affected all aspects of life in the Gaza strip, stressing the need to pressure the Israeli occupation to end the suffering of hundreds of people. On the International Day of Solidarity with the Palestinian people, we call on international organizations headed by Red Cross and the free people to pressure the occupation to break the siege by allowing entry of medicines, food and fuel to the Gaza Strip. MP al-Khudari also called on UN institutions to implement all UN resolutions for ending the Israeli occupation of all occupied Palestinian territories. The Occupied West Bank suffers from the Apartheid wall and settlement escalation, Jerusalem suffers from Judaization, and Palestinians in the territories occupied in 1948 suffer from uprooting and displacement, while the Gaza Strip suffers an oppressive ongoing siege, he said. 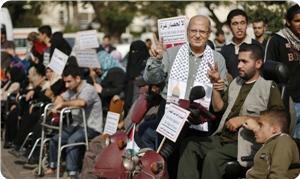 For their part, the participants called on the free world to stop the suffering of the besieged strip.